"Almost Daily Health Tips From Physiotherapist Blair Schachterle..."
How to Tell the Difference Between a Ankle Sprain and a Fracture. 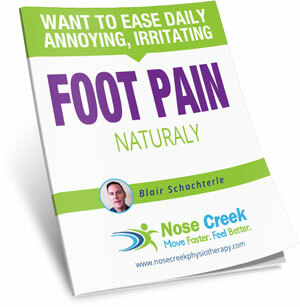 At one time or another, most of us have had an unfortunate accident that has caused an injury to the ankle. In the summer we tend to see more slip and falls due to more outdoor participation in sports, hiking, walking, and one very common injury is an ankle sprain or fracture. This usually happens when the ankle gets rolled over due to a quick pivot or simply stepping in a soft hole on the field or the hiking trail. We refer to this mechanism of injury as a “inversion”, where the sole of the foot is turned inward towards your other foot, and the body weight continues to transfer to the outside of the foot. Whenever you’re dealing with a joint injury, it can become a rather complicated process to diagnosis. This is mainly because it is possible to have a ligament sprain along with a fracture depending on the nature of the accident. Both ankle sprain and fractures can share a large portion of the same symptoms such as bruising, swelling and painful tenderness. A sprain is an injury to the ligaments that help stabilize the ankle bones and usually results from a sudden or gradual irregular movement or an unnatural twisting motion of the joint. A fracture refers to a break in the actual ankle bone/s which is comprised of 26 bones in your feet, with 2 major leg bones called your Tibia (inside) and fibula (outside). I have seen many ankle sprain and fractures while covering sports for a lot of years. Initially, the ankle will tend to swell up quickly and often you will see bruising, as bones when broken or chipped do tend to bleed a lot, but if the ankle has a CONSTANT ache that was unrelenting no matter what position the ankle is in, and there is limited ability to weight bear on the ankle and foot, you should go get an X-ray to rule out a fractured bone in the ankle. Sprains will tend to have INTERMITTENT pain once you have iced and settled the pain down and a movement pattern of pain reproduction, meaning when your reproduce the mechanism of injury you get pain, but at rest (non-weight bearing) there is little or minimal pain, whereas the fracture will keep thumping away constantly telling you something is really wrong no matter what position the ankle is in. With an ankle fracture, you will normally see the pain worsen over a period of time with the inability to bear any kind of weight on the bone. If you injure your ankle, place a cold pack over a washcloth to prevent frostbite, and decrease swelling and stabilize the ankle until you can get medical treatment. Protect – ankle brace should be worn and get on crutches ASAP to off load the ankle, be on crutches for at least one week, if it is a sprain. Fracture may require a longer period of non-weight bearing. Rest – frequent non-weight bearing periods, 6 to 12 times a day depending on your symptoms. Ice – frequently when you lie down for 15 minutes. Compression – use a 6 inch tensor to hold ice on, but also wrap tensor around ankle when moving to reduce any further swelling, especially if you do not have an ankle brace yet. Elevation – when lying down on your back, the ankle must be above your heart. 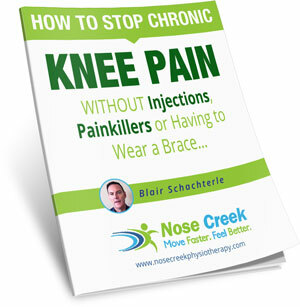 In the initial stages we want to reduce any further swelling or bleeding to the injury. Ruling out a fracture early on is important for us as your Physiotherapist, because our management of your injury will differ depending on the injury. Ankle sprains can start rehab within 2 days of injury, whereas the fracture will not start rehab until the bones are stabile and weight bearing is possible. With a fracture you maybe casted or put in a robo-boot to allow for bony healing to occur. Usually tibia and fibula take 6 to 8 weeks to fully heal, so you can start your rehab after that period. Because it can be very difficult to tell between ankle sprains and ankle fractures, an x-ray is almost always advisable. If you have a history of trauma to your ankle and are experiencing the characteristic symptoms of a fracture we described earlier, your doctor should obtain an x-ray of the ankle to make sure none of the bones have been fractured around the ankle and foot joints. If you have continuing pain from a wrist sprain or fracture, please call our Beddington clinic at 403.295.8590, or go to our website to book an assessment today. 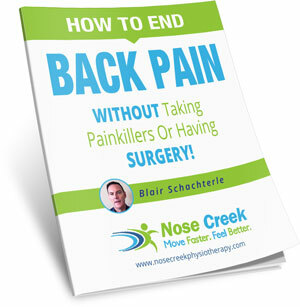 Blair has been a Physiotherapist at Nose Creek Sport Physiotherapy since 2001. Blair graduated from the University of Alberta with a BScPT in 1992. He has focused on Orthopaedic Manual Therapy and Sport Therapy. Blair completed his Sport Therapy Diploma in 1997, and his Advanced Manual and Manipulative Diploma in 1998. Blair is also certified for IMS (Intramuscular Stimulation) Dry Needling. Blair has a keen interest in active rehabilitation of recent and chronic, spinal and peripheral, joint and muscle injuries. 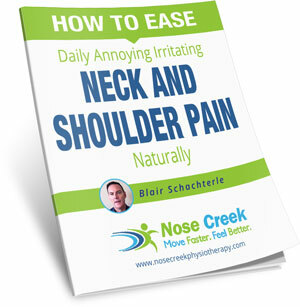 He enjoys treating upper neck pain that is associated with cervical tension headaches, sciatica (pinched nerve in lower back), shoulder injuries and traumatic knee injuries. Blair previously served for 6 years as the Executive Chair of the Canadian Academy of Manipulative Therapy (CAMPT). Blair balances his busy professional life by staying active. He enjoys cycling, swimming, working out, hiking, camping and snowboarding, depending on the season. Blair shares his free time with his wife, son and daughter outside on the weekends. He has learned to enjoy the journey, as life really is too short. How to Tell the Difference Between a Lower back Sprain and a Fracture in the Lower back. 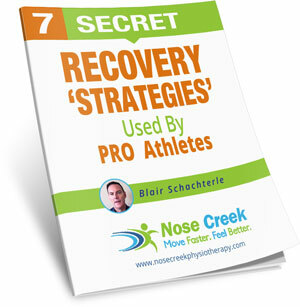 How Much Pain is Acceptable When Recovering From an Injury? And When Can I Go Back to Play? What kind of Pillow should I use?